Sorry for the delays in our postings lately, but life has been coming at us rather quickly since we arrived in the Chesapeake. We try and do a recap of each of our cruises and some thoughts on the equipment we have installed and used along the way. We departed Beaufort, South Carolina at 7:25 AM on the 14th of September and arrived at our slip in Pasadena, Maryland at 5:00 PM on the 6th of October covering a total of 753 statute miles, according to the trip log on our chart plotter. 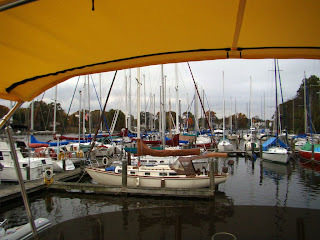 We only anchored nine times on this trip, and used marinas three different times for a total of ten days. Six of those days were to deal with repairs and four were to rent a car and drive north to take care of business. We also tied to the free seawall at Great Bridge, Virginia for one night. We motored for a total of 106 hours, added 150 gallons of fuel to our tanks in Beaufort and another 168 gallons in Great Bridge, but we could have made it to Pasadena on the fuel we had. The low cost at Atlantic Yacht Basin was the reason we topped the tanks off. We knew we would pay much more as we headed north. We still have 225 gallons in the tank now so our fuel burn rate was approximately 2.3 gallons per hour or approximately 1/3 gallon per mile. This is about what we expected to use running our Ford Lehman 120 hp engine at an average rate of 1800 rpms. As expected, the weather forecast was as confusing in the morning as it was the night before. So we weighed anchor and stuck our nose out into the Bay. As we rounded Stingray Point and crossed the Rappahannock the west winds that were forecast were out of the northeast, right on our nose. The forecast called for 10 to 15 with gusts to 20. We checked the buoy reports and the winds were all pretty much in the 8 knot range so we pressed on. Our biggest concern was crossing the Potomac since it is ten miles across and can develop some pretty big waves. The wind against the current was also going to make it a bumpy ride. 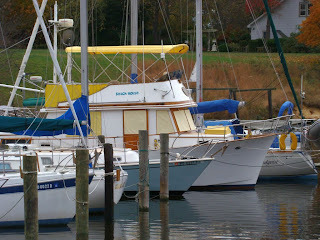 We had a fall back plan to head into Reedville, Virginia if the going really got rough. As we passed the Rappahannock Spit light and set a waypoint for Smith Point, the southern end of the Potomac, the winds continued to clock on our nose but the speed remained constant. The swells however, were getting larger. By the time we reached Smith Point, it was pretty uncomfortable pounding into the swells and whitecaps were everywhere. These are the conditions we usually stay in port for. We gathered all of our weather info at the end of the evening and decided not to decide where we would go the next day. We were up at our usual time and analyzed the weather info again. True to form, it had changed from the night before and actually looked much better than we expected. So we caught the 7:00 AM lock opening and headed for Norfolk. There were discussions about the Gilmerton Bridge being closed for construction but after a call to the bridge tender and radio contact with the tug working the bridge we determined there would be no delay. The next bridge past the lock is Steel Bridge and we arrived minutes before its scheduled opening. As we approached the Gilmerton Bridge, the barge was tied to the bridge wall and the bridge itself was open. We transited with no problems and headed through Norfolk. We have done the ICW so many times that we pretty much know from day to day where we want to be and where we plan to anchor or at which marina we want to stop for the night. But we still also like to try and find new spots, especially since we are no longer burdened with a six foot draft to limit access. After we have anchored or docked for the evening, had showers and dinner and are ready to relax, we still take the time to get out the charts and and plan the next days run and where we want to wind up. Included in our plans are fall back points in case of problems, weather or whatever and also fall forward points in case things go better than planned. We always say our plans are written in the sand at low tide.